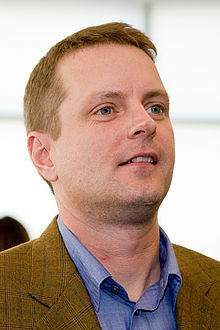 David Robert Filo (born April 20, 1966) is an American businessman and the co-founder of Yahoo! with Jerry Yang. His Filo Server Program, written in the C programming language, was the server-side software used to dynamically serve variable web pages, called Filo Server Pages, on visits to early versions of the Yahoo! website. Co-founder and Chief Yahoo, Yahoo! Inc.
Filo was born in Wisconsin. At age six, he moved to Moss Bluff, a suburb of Lake Charles, Louisiana. He graduated from Sam Houston High School and then earned a B.S. in computer engineering at Tulane University (through the Dean's Honor Scholarship) and an M.S. at Stanford University. In 2005 he gave $30 million to his alma mater, Tulane University, for use in its School of Engineering. Filo is married to photographer and teacher Angela Buenning. In December 2014, Forbes estimated Filo to be worth $3.8 billion, ranking him the 580th-richest person in the world. As of 2017, he is ranked 564th. In February 1994, he co-created with Jerry Yang an Internet website called "Jerry and David's Guide to the World Wide Web", consisting of a directory of other websites. It was renamed "Yahoo!" (an exclamation). Yahoo! became very popular, and Filo and Yang realized the business potential and co-founded Yahoo! Inc.
Yahoo! started off as a web portal with a web directory providing an extensive range of products and services for various online activities. It is now one of the leading internet brands and, due to partnerships with telecommunications firms, is one of the most visited websites on the internet. ^ "Yahoo! 2011 Proxy Statement" (PDF). Retrieved 28 July 2011. ^ "David Filo". Forbes. October 17, 2014. ^ a b "Forbes 400 Richest Americans: #292 David Filo". Forbes. March 2013. ^ "The World's Billionaires". Forbes. Retrieved 2017-05-24. ^ Alex Gray (April 10, 2017). "These are the world's most popular websites". World Economic Forum. Retrieved July 5, 2018.